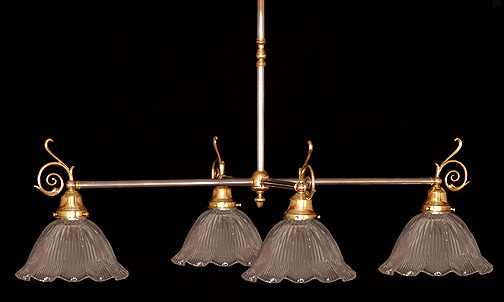 An English Country chandelier in pewter and polished brass. The oval configuration here will suit a rectangular or oval dinette or a billiards table. Prismatic glass shades finish it up nicely. Also available with all arms at even length for a round or square table. Shown in Pewter and Polished Brass. Available in different Metal Finishes, different Glass, Back Plate, more or fewer arms, arm direction, tubing style and many other Custom Options.